5 minutes is well within the catchment area by any reasonable definition. Is it really about trying to shave 2 minutes off, or is it about something else. I'm arguing that moving the station box a 2 minute walk away can actually result in 5 minutes in savings for some people in the catchment area. I'm arguing about where this catchment area exactly is. It's not a simple as drawing a circle around each entrance when you look at the walkable street/path structure. And it sure as hell will be easier to modify that structure in the Carlaw corridor than Pape. EDIT: Okay, I drew a map. All lines =400m walking. 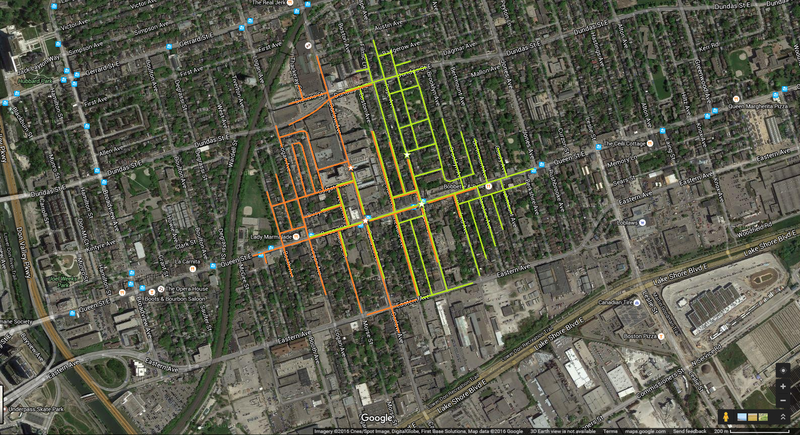 Orange = Carlaw station, Green = Pape. A Carlaw alignment puts more areas that can be developable into medium to high mixed use, and puts in within shorter walking distance and therefore increases value. The Pape alignment puts it along a lot of back alleyways behind single use homes. It's 200 metres between Pape and Carlaw. Factoring in the street structure and that the station boxes are aligned north of Queen, a Carlaw alignment would provide ~380m distance reduction (200+180m station box) for some new workers and residents on Carlaw (accessing north end of Carlaw station box vs south end of Pape station box). That's about 5 minutes. It doesn't seem like much but it is. The distance between Carlaw and Pape is nothing. On the other hand the distance between Queen Street station locations and the large employment nodes and after hours destinations on King Street require a 7-10 minute walk which includes crossing at least 2, possibly 3, maybe up to 4 arterial roads which is much more hostile to transit users. All because Kessmat wants to protect ScamTrack to the end. Unless you were to PATHitize those sections. Which again, goes back to one of my side points: what's the likelihood of that happening in a mixed use block vs a block of single family homes? You think residents are raising a fuss about the location of the station? How about making it easier for people to traverse through their neighbourhood. Pape -v- Carlaw. Assuming subway goes down Pape and hit's Gerrard Square (currently the McDonald's). How is the subway then going to get down Carlaw? It will take an S bend (i.e. two very sharp turns) to get it down Carlaw, or it goes under a bunch of houses between Pape and Carlaw at a gradual angle to get to Queen/Carlaw if that is where they move the proposed station to. It will also mean a sharper turn to get the subway down Eastern versus the more gradual turn from Pape. What's going to stop Carlaw residents (of which there are many more) kicking up the same level of fuss as Pape residents. One other point - Carlaw is a major artery from Lakeshore/Gardiner into the East end. I can only imagine how chaotic traffic will be if Carlaw is chosen. Dig deeper then so no one notices as it is being tunnelled. The Relief Line is expected to reduce congestion on the Queen and King Streetcars by 69% and 74% heading westbound at rush hour! Nice to finally have numbers to place next to that point. Noticed that the ridership on the Relief Line would be double, extending it to Sheppard. I think that is daily new riders. That's just a single bridge, not an entire elevated route. Is the Gardiner Expressway ugly? Then who should be then? If you don't a personal stake in what is being built then why is your opinion any more relevant than those of local stakeholders - like those at serious risk of mass expropriation if Pape alignment south of Gerrard is chosen over Carlaw. Where can't be so anxious to get a DRL under construction that we throw common sense out the window in the process. Other way around. Carlaw above. Pape under. Each photo looking north from north of Queen. I'm wondering how many of the "NIMBYs" will actually hold onto their homes or sell them to developers (at a good price) for new commercial and/or residential high-rise buildings? I guess the problem is that developers can choose which parsel of land to assemble. If one homeowner would not cell at any price, they can buy another lot and still build their highrise, as long as the zoning rules allow that. For a subway station, there is much less flexibility because it has to be on the route, straight, horizontal, have space for exits and meet a few more additional requirements.